What’s in it? All sorts of lacy goodness, in both garments and accessories. Bisbee: One of my favorite garments. I love the lace panels, the little hems, and the shaping. The 3/4-sleeves are so comfortable. Cactus Wren: Another one of my favorite garments. I actually get to wear this here in California. I love it. It’s comfortable, flattering, and feminine. You can wear it over a shirt as a vest, but I usually just wear it over a cami. Cholla: Great lacy socks. I love the stitch pattern and how it works with the gorgeous color! 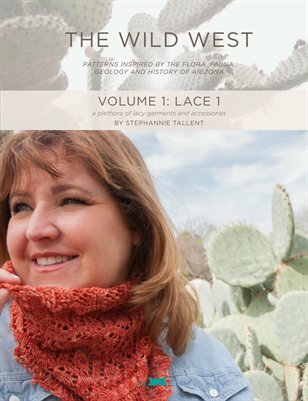 Pinyon Jay cowl (shown in 2 of 3 versions, below): Lace and beads! Three different yarn weights; each fits a little bit differently, too. Diamondback: Lace, beads, and a little bit of cables in this cowl.